Venue: Pusat Latihan Perhutanan Pahang (PLPP), Belimbing, Maran, Pahang. This programme was one of many efforts taken by the Counselling & Career Services Unit (CCSU), ODDSTA, CFS IIUM Kuantan to help the university in developing well balance personality of CFS students. The programme holds the theme; “Accept Challenges” and it was targeted to standard four (4) until standard six (6) school prefect and class monitor of Sekolah Kebangsaan Bukit Setongkol, Kuantan, Pahang. It was a collaborative programme with the management of the school, whereby the school had invited the CCSU to send CFS Peers to become the facilitator of the programme. Certainly, the programme requires full commitment and involvement from CFS Peers members as facilitators. The programme aims to develop positive attitudes and leadership qualities of school students (the participants), as well as to sharpen the skills of CFS Peers members in managing programme outside campus and in facilitating group activities. 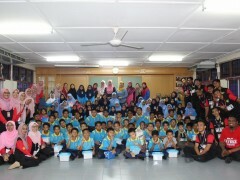 Eighty (80) participants (students of Sekolah Kebangsaan Bukit Setongkol) were involved in this programme. CCSU sent twenty (20) CFS Peers members to become the facilitators of group activities to the participants.